I’ve been hearing about Eat at Joe’s for a few years now. Everyone said they serve amazing hash browns. I’m happy to report that the hype is true. Eat at Joe’s is a tiny little place on the side of the CVS at the corner of Mayfield and Green Roads. 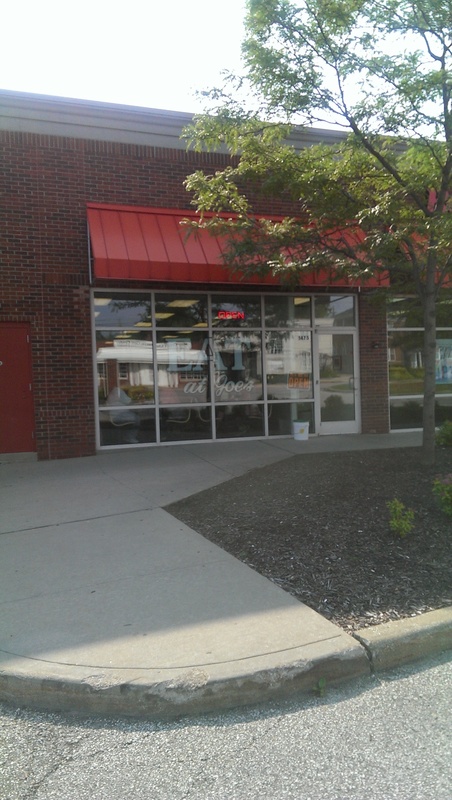 It is just a solid spot with no frills, good food, and a nice staff. The prices are low, and the hash browns are amazing. The menu is small but covers all the basics. Breakfast is served all day: 3-egg omelets, pancakes, French toast, and your basic variations on eggs/hash browns/breakfast meat/toast. Lunch features some sandwiches, burgers, soup and a couple salads. N othing is over $5.50. As I said, the place is really tiny and from what I hear it is always packed, especially on the weekends. But tables turn over quickly; this is not a place that people tend to linger. Two tips: it is only open until 2 pm, and it is cash only. On my first visit I knew I wanted the hash browns. I wasn’t sure what else I wanted. I walked in shortly before 10 a.m. on a Friday, stood behind a gentleman, and waited for a seat to open up. He took a small two-top that was vacated, and then I saw there were several seats available at the counter. I grabbed the seat on the end and was immediately greeted by a server who asked what I wanted to drink. 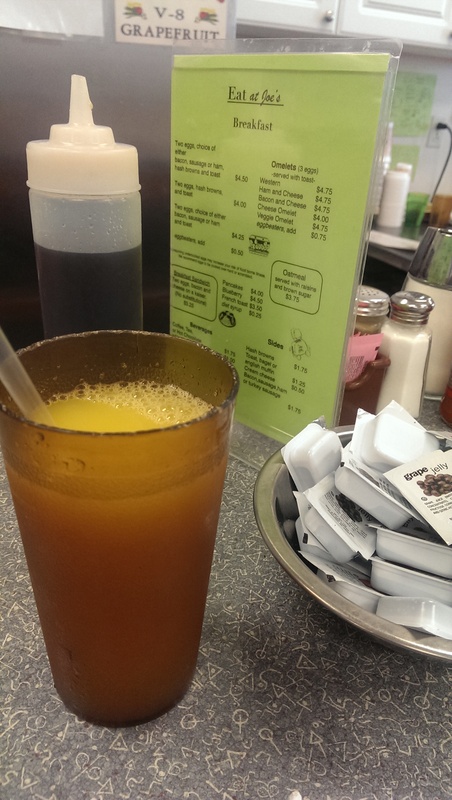 I ordered a large orange juice (for $1.50). 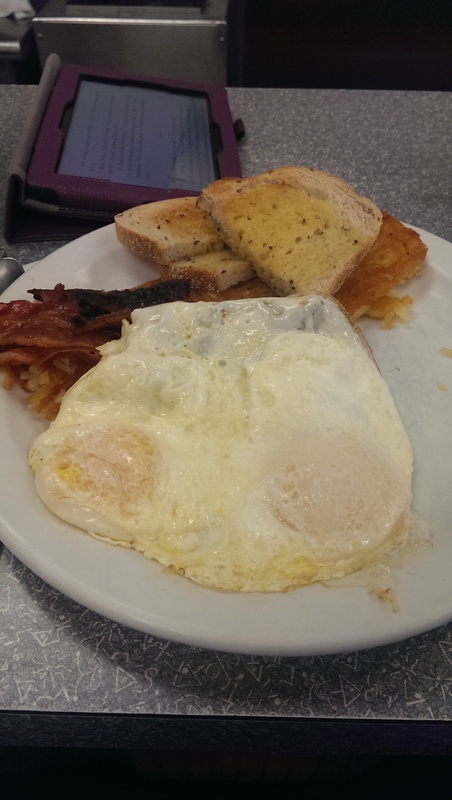 I then looked at the menu in a little table stand and ordered a standard diner breakfast of two eggs over easy, bacon, hash browns, and rye toast. At some point a young guy came in and sat next to me and was immediately greeted by name and asked if he wanted coffee. You’ve got to love a place that recognizes its regulars. Some other guy seated at a table by the kitchen, who was also obviously a regular, yelled out for a server who was too far to hear them calling for her to pick up an order. That’s camaraderie. The guy next to me got his cinnamon chip pancakes (a special) and sausage before I got my breakfast. I immediately regretted not ordering the pancakes. They smelled wonderful. Soon after my breakfast was brought out. The eggs were perfectly cooked (so much so that I ended up wearing a few drops of egg yolk), one strip of bacon was crisp (see the almost burnt piece in the photo) while the others were well cooked without being too crisp, and the rye toast was small but well-buttered. The hash browns were as good as everyone says. They were crisp on one side and soft but not undercooked on the other. I was in heaven. I didn’t even ask for ketchup, which I usually do for breakfast potatoes. My bill came to $6.49. I rounded up to an even $9, because I follow Robert Fulghum’s advice and always overtip my breakfast servers. It was still a bargain. 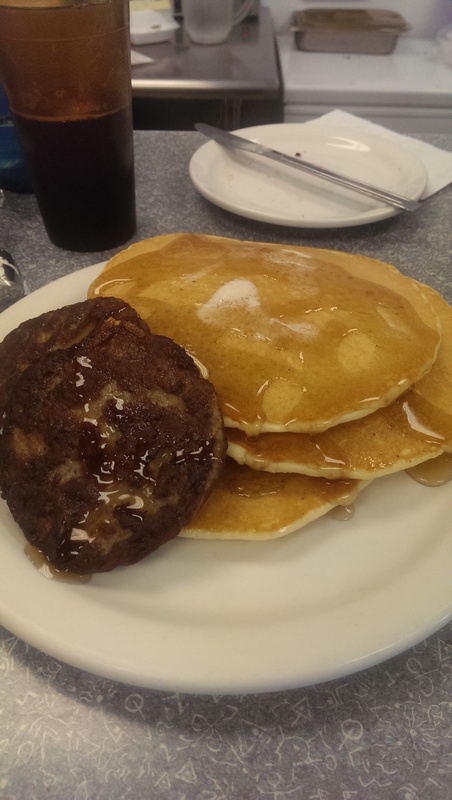 I went back a few days later for the cinnamon chip pancakes and a side of sausage because it sounded so good. Once again I sat at the counter. The counter seems to be the place to be, because I got to witness an epic obnoxious customer along with my breakfast. She was arguing with the waitress over a $1 brownie because she wanted a middle piece and not an end piece. The waitress told her she couldn’t stipulate what she got, while she demanded that she could because she was the customer. They ended up giving in to her because she wouldn’t let it go. Epic. I almost wished they served popcorn. Meanwhile, the older guy on my left (greeted as a regular) was home from wintering in Florida and on his way to Cape Cod for the summer. Eat at Joe’s attracts all kinds of customers apparently. In any event, the cinnamon chip pancakes were delicious and went very well with the side of sausage. They were actual cinnamon chips and not chocolate chips with cinnamon mixed in. They were lovely. You can’t see them in the photo because they were on the bottom. I ordered a coffee and a large cranberry juice. 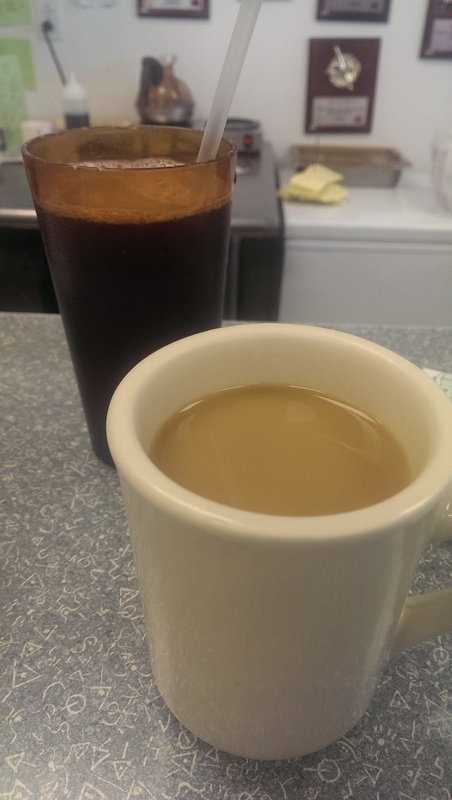 The coffee was decent, and they both hit the spot. My bill was $8.65. I stopped in a third time to grab a quick lunch at 12:30 because I was going to be in the area on an errand. 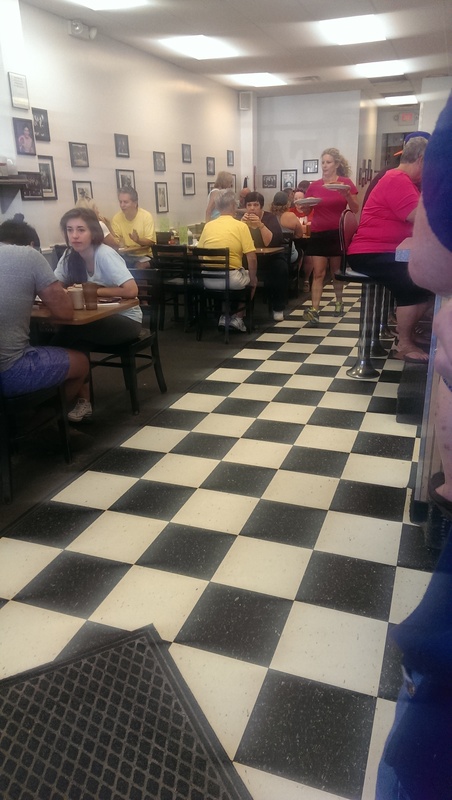 There was ample seating at the counter and a couple tables available. The turnover continued as I sat there and people-watched. I ordered an iced tea, a cup of soup, a tuna melt and a side of hash browns. I even got to choose what kind of bread (rye again). The soup that day was yellow split pea. It didn’t wow me, but it was a nice choice for a dreary day. My tuna melt and hash browns were finished super quick before I could finish my soup, and they were amazing. 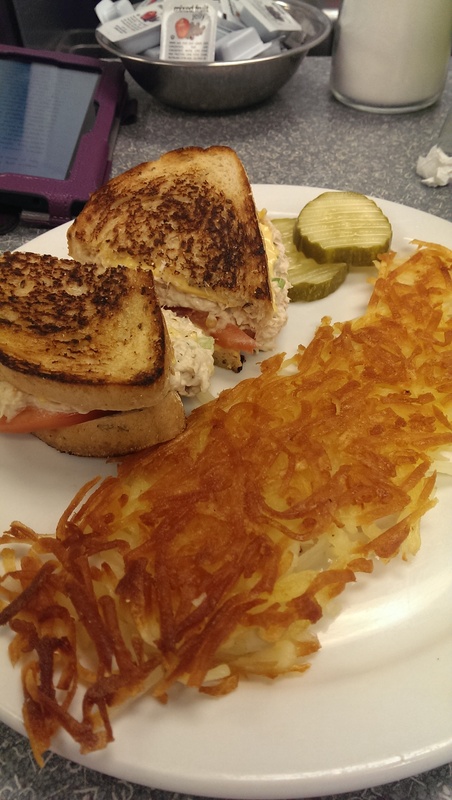 The cheese on the tuna melt was nice and melted, the tuna overflowed onto the plate (and paired well with a dill pickle slice), and the hash browns were as crisp as before. My bill was $12.20. This place is definitely going on my regular rotation, and I’m going to need another tuna melt soon. Update: I went there and ordered lunch choices – a bacon cheeseburger and veggie beef soup. Stick with the breakfasts. The burger was served on ciabatta bread, which I hate, even though a breakfast sandwich is served on a Kaiser roll. The burger was well done, something was burnt to a crisp on the edges, and the soup was just okay.